Quakers junior Christian Angelini spent seven months imbedded with the team and produced a 40-minute documentary on their road to a state championship. To be a good reporter means being able to get to the story, but to also stay out of the way and never insert yourself into the story. To be an effective video producer on deadline, you have to be equally adept at shooting and editing, as well and having a calm and determined demeanor. Moorestown High School junior Christian Angelini was all of those things and when his seven-month-long project was nearly over, he received the ultimate payoff: his day-to-day coverage of Moorestown’s boys basketball season became a window into one of the best seasons in school history when the team won its first state championship in 60 years. After more than a half-year of interviewing, shooting and editing, and a furious finish to have the project ready in time for the team’s end-of-the-year banquet, Angelini’s passion project, “One Last Run,” a 40-minute documentary on the Quakers’ season, is on YouTube for everyone to see. 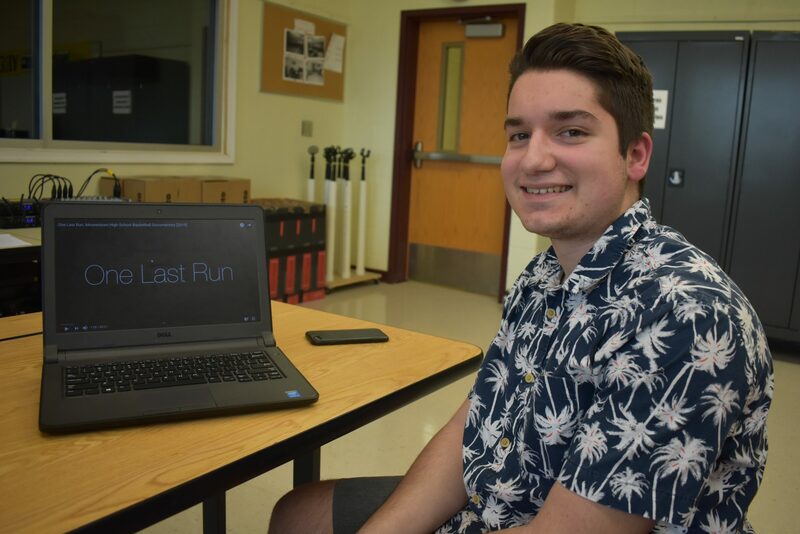 Angelini is in his third year in the high school’s video production class, but he has yet to take any of the three (soon to be four) classes Jessica Noguera teaches in video production. He’ll take his first class as a senior next year. The mostly self-taught Angelini got his inspiration from HBO Sports productions, like the NHL’s “Road to the Winter Classic.” He used his own personal, 10-year-old Canon 60D camera and its two lenses and edited through iMovie to shoot and produce the film. He also spent the bulk of the first two months of the school year filling up a notebook with ideas for shots, music and interviews. “I can’t even believe his dedication,” Noguera said. “The amount of time he spent traveling with the team, going to every single game and filming every single game, and having the team embrace him as part of their people. I think one of the most impressive parts of his project was getting to see things we didn’t even know had happened. The fact that he was so much a fly on the wall in the locker room, hearing the coach’s speeches, getting to every single player. Angelini, a former lacrosse player, decided to take quit playing sports and transfer his passion for them into sports media when he entered high school. He’s worked with the basketball team for three years shooting photos and video. Last season he made a 15-minute highlight film for the banquet. Angelini, who hopes to major in journalism in college, challenged himself to produce something grander this year. When the team made history, winning the program’s first state title since 1959, it was both a boost for his project but also a deadline nightmare: the season ended on March 15 and the team’s banquet was March 26. He missed some sleep during a couple of those nights but still pulled it off in time.